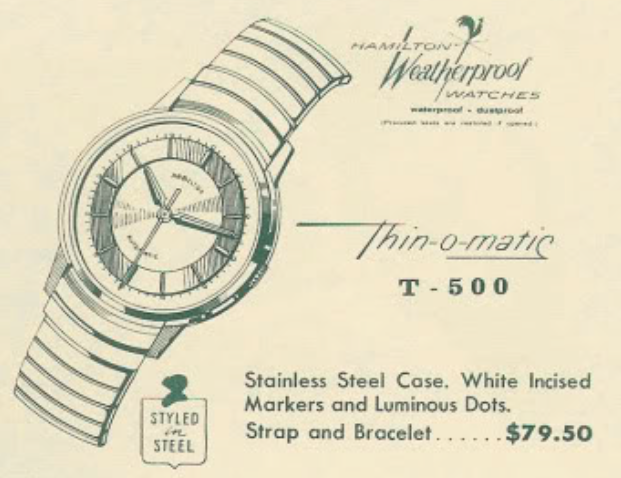 1959 Hamilton introduced the Thin-o-matic line of automatic watches. At the time, Hamilton was forming a joint venture with Buren Watch Company, a Swiss company. Many, but not all, of the Thin-o-matic models used Buren micro-rotor movements. Actually, you could probably say most, but not all, models used Buren movements. There are a few Thin-o-matics that used ETA grades. Anyway, one of the first Thin-o-matics was the T-500. It was produced for three years. The T-500 came in a stainless steel case and featured a textured dial with a silver-colored chapter ring or "white incised markers" as Hamilton called it. The hands are luminous and the dial has luminous dots. Inside the T-500 is a Hamilton 666 movement with 17 jewels. Most automatics have two levels, one for the watch mechanism and the another with the automatic complication added on. The 666 movement, as well as the other micro rotor movements, incorporated the automatic complication on the same level as the watch mechanism - so all of the parts are tucked in tightly amongst each other. The micro rotors are very nicely designed movements but there are varying opinions about how well the small rotor really powers the watch. Opinions are like belly buttons... everyone has one, but I think there could be some basis for the thought the rotor is a little undersized to keep up. I think the T-500 must be a popular model because I see them regularly for sale but they always sell above my typical project-watch target price. I finally landed one a few weeks ago but it took me about a month and a half to work up the courage to tackle another micro rotor movement. They are very intimidating movements with lots and lots of tiny parts to lose or break if you're not very careful. As received, my project watch was a bit beat up and didn't run at all... not even briefly or when shaken. I didn't realize until doing this post that my dial is a little unique. The hour locations are filled with lume and there are no "dots" on the dial. I don't know if it was originally like this but there's no indication the dial has been refinished, so who knows? I suspect the lume was added later but that doesn't explain the missing dots. The case is in good shape though and, looking closely at the case back, I can see that it should pop off when I apply some pressure with a case knife. The movement looks clean enough and I can see a previous watchmaker's mark inside the case back. So this watch has been to a watchmaker at least once in the last 56 years. Without the dial in the way, you can see the movement looks like your typical watch movement but there are a bunch more tiny pivots on the left side where all of the automatic-related wheels are supported. All of the jeweled pivots are located in the lower right of the photo below. It's looks like only about 1/3rd of the main plate's real estate is used for the time keeping gear train. Looking at the back of the movement more closely, you can see that a good 50% of the movement is time-keeping related and the other half is for the winding mechanism. The first thing to come off is the rotor and you can see by the red color that there's a jewel supporting the rotor arbor. I find letting the mainspring down to be a real challenge on micro rotors. I usually will just remove the balance and then pull the pallet fork, as that will allow the gear train to unwind freely. However when I did that below, none of the wheels turned. That tells me the works is likely gummed up by dried oil. My hypothesis about dried oil was further supported by how hard it was to remove the balance jewels when I opened their shock springs. They felt like they were glued in place but I was able to free them eventually. Once I carefully pulled the train bridge, the mainspring barrel rotated until the mainspring tension was released. Now it's just a matter of taking each part off, piece by piece, while I work my way back to the autowinding mechanism. After taking the photo above, I noticed the auto mechanism was missing a reversing wheel. That meant that the rotor was not actually winding the watch, even though it would swing freely. Luckily I have a donor movement so I can put it back in proper order. All the parts are cleaned and dried so everything is ready to be reassembled. First I'll start with the time-keeping parts - so that I know the watch will actually work once it's put back together. With the train wheels, including the barrel, back in position, the gear train spins freely when I wind the watch. That's a good sign that the reason for not-running has been corrected. Next up is the pallet fork and the balance. Then I'll know for sure if the watch runs. In the shot below you can see the pallet fork has been reinstalled. I can now wind the watch and the pallet fork will keep the wheels from turning freely. Once the balance is back in place, the balance will release the mainspring tension each time it swings past by the pallet fork... one tick at a time. The balance assembly is reinstalled and the watch is running but I still have to reinstall the upper shock jewel before putting it on the timer. There... now the balance is moving with good motion. It's off to the timer to find out how well it's running. It's running a little fast but everything else looks good. I'll slow it down after I reassemble the rest of the movement. I've worked my way back to the rotor assembly. All that's left now is to put the rotor weight back on. A new crystal will go a long way toward improving the looks of the watch. 29.8mm diameter will do the trick. A slight tweak or two to the regulator brings the beat rate to an acceptable 5 seconds fast per day. With a fresh black lizard strap, this Thin-o-matic T-500 looks great. As you can see, the dial has black marks where the "luminous dots" would have been. Were they ever actually there? I don't see any evidence there were ever any dots and the luminous paint on the chapter ring looks pretty good so I'll leave it. This is a sharp looking watch and looks even better in person. Is the Buren micro-rotor noticeably heavier than would be a typical rotor? At one time, had thought to buy one of those movements on Ebay, just to play with. The bidding always ran higher than what I wanted to pay. Have always wondered about that rotor and what metal alloy was used. I don't know what the alloy is but it's not noticeably heavy. I think it's all about the torque that it provides and the efficiency of the winding gear train. Bigger rotors can have more torque. But maybe the gear train on the micro-rotors is more efficient? I'm sure there's a reason that many people think they are underpowered.